All right, it was bound to happen. A review for Coco Mademoiselle, possibly the most popular fragrance amongst perfume consumers today. True, she doesn’t have the history of Chanel No. 5 but she’s undeniably pretty with a very appealing personality. So let’s cut to the chase already. In Bottle: Strong, very sweet lychee on top with a layer of very sheer florals you really have to focus in order to detect. Applied: I know what the notes list says but there’s lychee in this and it’s the tippy-top of the notes pyramid. Coco Mademoiselle opens with a blast and a loud announcement that you’ve just arrived and you feel fabulous. It’s sweet, very loud, and predominantly lychee with a faded florals sort of scent lingering in the back. As the lychee settles a bit you get a hint of sweet orange flower and equally sweet mimosa. The fragrance starts to age into the mid-stage and that’s where you get something a bit more exciting. There’s a sheer white florals scent that keeps Coco Mademoiselle from being completely ridiculous as it blends so beautifully with the sweet notes in this fragrance. The rose note in this is particularly beautiful, it masks itself well with the florals and the lingering fruitiness of the opening, but it’s very, very modern rose. I might be a bit crazy here too but there’s something to Coco Mademoiselle that smells a bit like powder to me. Chanel giving me powder in a fragrance this modern? Kudos, Chanel! The dry down is lovely as well, when Coco Mademoiselle flings off the last of her silly lychee and embraces a warm, very clean, vanilla scent. Coco Mademoiselle, like most Chanels, projects and lasts a long time so go light on that sprayer. Extra: Coco Mademoiselle was composed by Jacques Polge in 2001. It has consistently performed well in terms of sales since its release. Due to the popularity of Coco Mademoiselle, it is often one of the most counterfeited perfumes out there. In fact, I did a quick look on eBay and there’s at least three counterfeits on the first page of results at the time of my writing this. Definitely beware if you plan on buying this online. Design: The eau de parfum version of Coco Mademoiselle sports the beautiful Chanel No. 5 style with the squarish glass bottle and cap. The cap for Coco Mademoiselle is a frosted glass. The shape is beautiful, the design is fitting and I simply love it. I still abhor most of the eau de toilette versions of Chanel’s fragrances though. Notes: Orange, mandarin, orange blossom, bergamot, mimosa, jasmine, turkish rose, ylang-ylang, tonka bean, patchouli, opoponax, vanilla, vetiver, white musk. All right so what do I think of Coco Mademoiselle? Well, its’ a very popular fragrance. I think it consistently shows up in top perfume sales so I doubt it’s going away any time soon. I actually own a bottle of the stuff but I rarely use it. It is very strong, has very good longevity but it is everywhere. Absolutely everywhere. There’s no exclusivity to Coco Mademoiselle. The fragrance is highly recognizable and it’s a household perfume at this point. Couple these two facts with the realization that a lot of people love it and you get a perfume that pretty much haunts you no matter where you go. As for me? I’ll be happy spray this on when I feel like it, but Coco Mademoiselle isn’t an every day thing and certainly not a perfume I’d wear if I wanted to avoid smelling like everyone else. 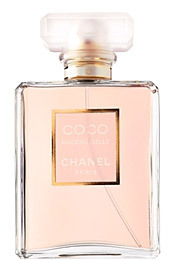 Reviewed in This Post: Coco Mademoiselle, 2009, Eau de Parfum. This entry was posted in chanel, floral, Reviews By House, sweet and tagged bergamot, jasmine, mandarin, mimosa, opoponax, orange, orange blossom, patchouli, tonka bean, turkish rose, vanilla, vetiver, white musk, ylang-ylang. Bookmark the permalink.